In 1983, Berkshire began as one of the first companies to provide an automated way of preparing affirmative action plans (AAPs) for companies. As a result, Berkshire revolutionized the way AAPs were prepared, and we continue to set the standard for the tools needed to build a balanced workforce. Over the years Berkshire continued to expand its capabilities beyond AAPs. Our current offerings include a range of services, training, software, and web-based products that allow companies to depend on Berkshire for a comprehensive solution. Due to the quality of our services and software, we are one of the most sought after providers in the industry. Hyrell believes hiring a new employee should be an efficient and rewarding experience that results in a timely return on your investment. 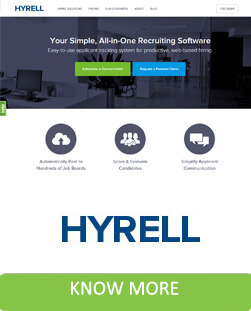 We’re dedicated to helping you meet your recruiting challenges with simple, yet powerful web-based applicant tracking software. Our 30 years of experience has taught us that most business challenges result from misalignment between a company’s vision – where they want to be, and their culture – how they actually operate. We have helped many companies get on the path to sustained success by building strong, healthy cultures that are intentionally aligned with critical business objectives. To accomplish this, Corvirtus provides culture-driven hiring, development, and retention solutions and tools that deliver engaging employees who delight your customers and are a competitive advantage for your business. 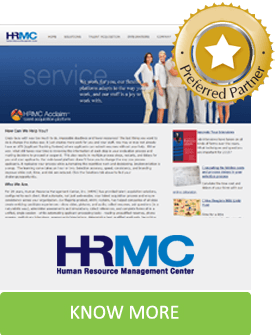 The Human Resource Management Center (HRMC) is a web- and phone-based Software as a Service (SaaS) provider, specializing in artificially intelligent, automated human resource processes. For more than 29 years, we have pioneered innovative, award-winning human resource solutions, ultimately developing the industry's premier Talent Acquisition platform, HRMC Acclaim. 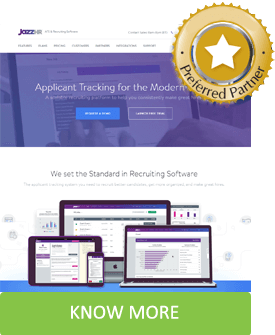 JazzHR is a powerful, user-friendly and affordable applicant tracking system (ATS) that is purpose-built to help growing SMBs exceed their recruiting goals. Named the "#1 Most User-Friendly ATS" by Capterra, JazzHR replaces time-consuming, manual hiring processes with intuitive hiring tools that help recruiters and hiring managers build an effective recruiting process that results in great hires. Our team has combined the wisdom of operational management experts, human resources specialists, serial-entrepreneurs, business development consultants, top marketers, and of course a great information technology team to build one of the most advanced video recruiting platforms on the market. 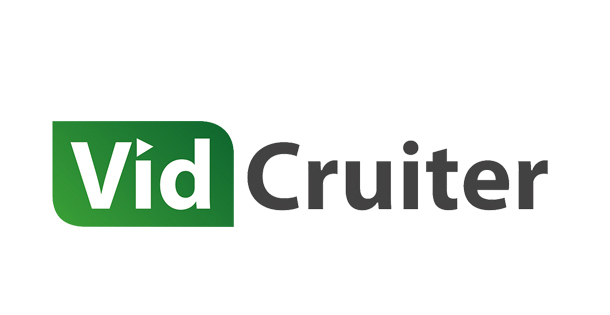 Our goal is to get you to use, love, and benefit from VidCruiter. We continue to innovate in all dimensions of recruiting, and we can proudly say that we are the first company to build an Applicant Recruiting Software, also called an Applicant Hiring System. Our commitment to quality is reflected in our products and our culture. If you need assistance with any aspect of what we do, please do not hesitate to reach out to us. Say goodbye to scheduling mid-day phone screens (and having people miss them). Candidates answer on their own time and you are notified instantly when they do. Watch responses at any time, anywhere, on desktop or mobile. TalentValue helps companies hire, train, and retain the right people through innovative, interactive and integrated web based systems. While your employees can take your organization to incredible heights of success, they also present some of the greatest challenges you face every day. 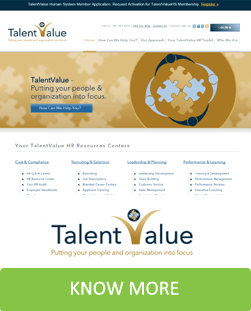 TalentValue is your resource to help identify and solve the people issues you address so you can get back to running your business. 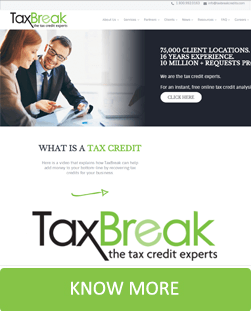 Founded in 1998, TaxBreak has focused solely on tax credit recovery and is honored to be recognized as an industry leader in tax credit processing. Our focus on capturing the maximum credits for our clients has never wavered. If we don’t find every penny that is available for our clients, we fail. Over the past 15 years, we have developed a long-standing relationship with government agencies, which has allowed us to unify our systems with numerous government systems, granting us unique access. This access allows us to obtain all the resources available to companies in order to recover the most tax credits available. 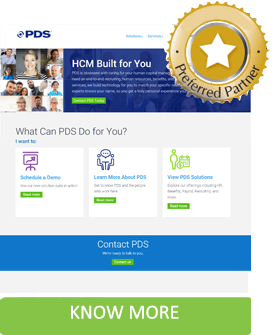 At PDS, we provide HCM solutions and technology that solve problems for people. We listen, build technology to match your unique needs, and tirelessly try to make things better. Our safe and secure HCM platform crushes the most complex problems, and we deliver HCM solutions across the entire employee life cycle with innovative, personalized technology. 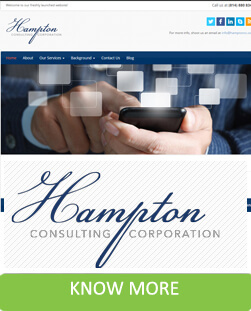 Most important, our HCM solutions are backed by a team of experts who know your name. SinglePoint is a Human Capital Management (HCM) business services company that provides a wide range of solutions delivered through a combination of SaaS (software-as-a-service) and administrative services. The SinglePoint product includes a centralized database of HR, Payroll and Time & Attendance information. Full payroll/tax services relieve employers of the burden of maintaining compliance with ever-changing regulations. SinglePoint’s open architecture empowers customers to choose solutions from dozens of companies providing talent acquisition, benefits enrollment, onboarding, tax credit screening and much more! From our first account in Paterson, N.J., to the more than 610,000 clients we serve around the world today, ADP helps organizations of all types and sizes unlock their business potential. For 60 years, we’ve led the way in defining the future of business outsourcing solutions. And we remain one of the world’s most innovative, diverse and admired companies to work for today. 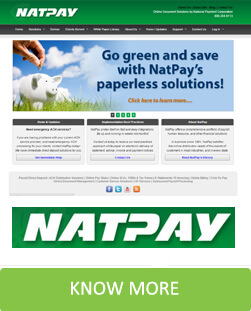 National Payment Corporation (NatPay) was founded in 1991, and became the leading company to offer third-party processing of Direct Deposit for employee payroll. We process more than $12 billion in employee direct deposits annually. In 2000, NatPay introduced the first electronic pay stub branded as EZStub. In 2007, NatPay introduced Doculivery – a fully web-hosted SaaS (Software as a Service) delivery of enterprise resource solutions. This includes but is not limited to Payroll, AR/AP, full HR paperless functionality, CSR/CRM, and other marketing solutions. 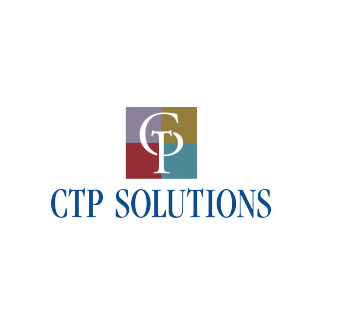 Our innovative solutions reduce cost, improve control and raise operational efficiency which enables our clients to improve profitability, while utilizing a mixture of experience, and improved processing through technology and strategic partnerships. Since our founding over 25 years ago, we have been able to deliver these efficiencies by remaining on the cutting edge of changes that create opportunity. The industries we serve include Financial, Distribution, Healthcare, Hospitality, Services and Manufacturing industries. What we learn in one industry, we are often able to translate to other industries. 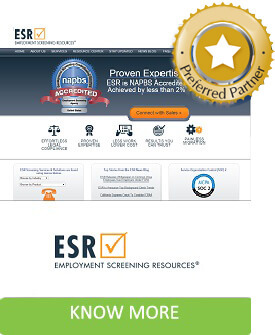 Employment Screening Resources (ESR) is a leading, global screening firm providing on-demand access to compliant and accurate background screening services that empower our clients to quickly make informed hiring decisions. ESR is the only screening provider offering real-time compliance via its proprietary ESR Assured Compliance® system which helps employers to consistently comply with changing local, state and federal laws. ESR’s solution is integrated with the most visible HR technologies to ensure a seamless user experience. ESR is accredited by the National Association of Professional Background Screeners (NAPBS), a distinction held by a small number of screening firms and is audited yearly for an SSAE 16 SOC2 Type 2 compliance, distinctions held by a small percentage of screening firms. 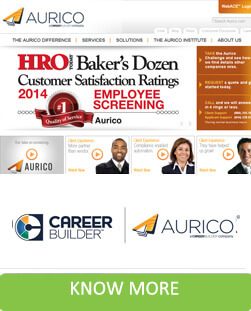 Aurico provides remarkably in-depth and accurate background screening, drug screening, selection assessments and other related HR solutions that help you hire and retain the “A” players, leading to a higher performing organization. We are a leader in the field of background screening, providing services nationally and internationally to clients ranging in size from Fortune 500 enterprises to business start-ups. Whether they come to us from a less-than-ideal experience, through the Aurico Challenge, or through a referral from one of our many satisfied clients, they often remain long-term customers because of the way we deliver exceptional service, efficiency, proactive solution-based thinking and minimized risk. 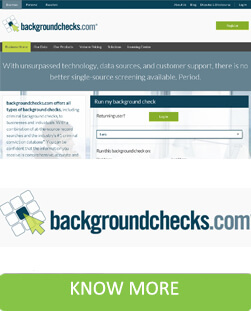 Founded before the turn of the century, backgroundchecks.com is a founding member of the National Association of Professional Background Screeners (NAPBS®) and cofounder of the Expungement Clearinghouse. We serve thousands of customers nationwide, from small businesses to Fortune 100 companies, by providing innovative and comprehensive screening services. Headquartered in Dallas, Texas, with an Eastern Operations Center in Chapin, South Carolina, backgroundchecks.com is home to the #1 online criminal conviction databases in the industry. The healthcare market is changing quickly. Employers need to find healthcare partners that examine risk and generate a benefits strategy based on an approach which addresses employer and employee financial exposure, quality of care, compliance and overall health of employees. Traditionally small employer groups have only had access to the “same old” fully insured carrier plans. With these plans there is no incentive to keep employees healthy as there is no upside for investing this type of proactive strategy. The only way for employers to cut cost was to push the financial burden to employees via plan design change and increased out of pocket exposure. 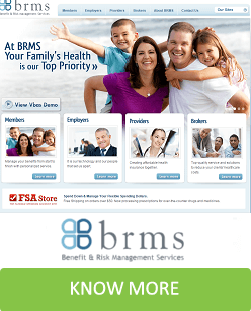 Established in 1993, Benefit & Risk Management Services, Inc. (BRMS) is a leading benefit administrator and healthcare risk manager that delivers innovative technology and administration solutions that control rising healthcare costs. 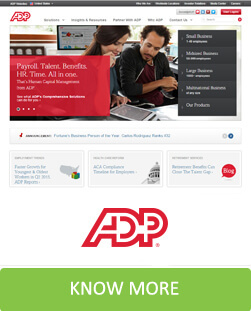 One of the first to introduce employee benefit administration technology solutions, our services are powered by our exclusive Virtual Benefits Administration System (Vbas) — a proprietary database and administration system that allows employers to save time and money by automating management of the benefit supply chain and empowering employees to self-service their benefits.